Sand Moor is among the most prestigious clubs in Yorkshire, and is a treat for any golfer visiting Leeds. 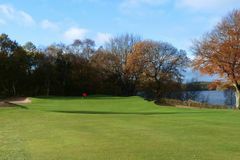 The local area is rich in golfing options which can be combined to form a fantastic golf tour - Alwoodley and Ilkley are among our recommended choices. The great tradition of Sand Moor begins with the club's foundation in 1921, but the most notable development in its history is Dr Alister Mackenzie's involvement in revising the initial layout of the course. Mackenzie is revered by many as the finest course architect in the game's history, giving an insight into the quality of the par-71 layout at Sand Moor. Well matured and extremely well established, Sand Moor is superb test of parkland golf that is used for some prestigious amateur and professional events - a young Nick Faldo is among those to win tournaments at this Leeds gem.